Have you been wondering what the best sewing machine for quilting is? Quilting is a wonderful hobby that allows you to share your creativity with your loved ones. Quilts are both functional and beautiful, and they’re often passed down to family members for many generations. But naturally, participating in this hobby requires having the right tools. Not all sewing machines are ideal for quilting. Having a bad machine can make your work much more difficult and tedious. How is quilting different from sewing? What should you look for in a sewing machine for quilts? What are some good optional features? How Much Will a Sewing Machine for Quilting Cost? So What Is the Best Sewing Machine for Quilting? We gathered each of these machines’ basic features and specifications from their official websites. 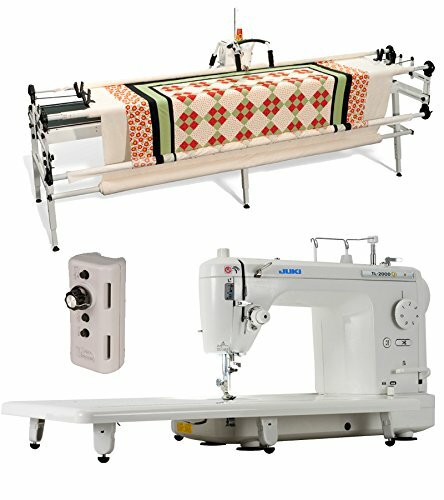 We also used sites like sewingmachineplus.com. Our opinions were mostly informed by customer reviews from sites like Amazon and sewingmachineplus.com. When reviewing these machines, we chose to focus on aspects such as speed, power, features, ease of use, and of course, price. We also made sure to look at each machine from a quilter’s point of view in particular. This way, we can determine which is the best sewing machine for quilting. Here are a few of the best quilting machines on the market today. This list is in no particular order. The Juki TL-2000Qi is a trendy model, and many consider it to be the best sewing machine for quilting. It weighs 25 pounds and is capable of sewing 1,500 stitches per minute. Additionally, it also comes with presser foot pressure adjustment, LED lighting, and a needle up/down button. There even a microcomputer-controlled speed control mechanism that helps you sew as fast or as slow as you want. Customers love this machine for how quiet and easy to use it is. It also has power and longevity. Most of the complaints have been relatively minor. Some customers have trouble getting this machine up and running on the first day. You have to follow a few steps before you can start using it. But once you get started, you'll be OK and not have any trouble. This might seem like a lot at first glance, but it’s fairly reasonable when you consider the quality. It’s a very powerful machine, and it’s also very beginner-friendly when you get past the initial setup.Therefore, many would consider it to be a worthwhile investment. Amazon gives this sewing machine 4.4 out of 5 stars. The Singer Quantum Stylist 9960 is another great machine with a few interesting features. It weighs only 18 pounds and has a maximum speed of 850 stitches per minute. It also has an LCD screen which shows you what stitches you’re using along with foot recommendations. Speaking of which, it comes with a wide range of foot attachments for you to choose from. You also get 13 one-step buttonhole styles and built-in lettering. This vast array of features has left customers very happy. It’s also quiet and dependable. However, there has been one major complaint. You’re unable to use the quilting bar with the walking foot. Quilting is much easier with a walking foot, so this is a very serious issue. There have also been some complaints about the lettering not being as efficient as it could be. This machine will cost between $300 and $500. This is actually a decent price considering the number of features it has. It might be worth the price if you’re confident in your ability to quilt without a walking foot. However, beginners might want to start somewhere else. This machine has 4.1 out of 5 stars on Amazon. 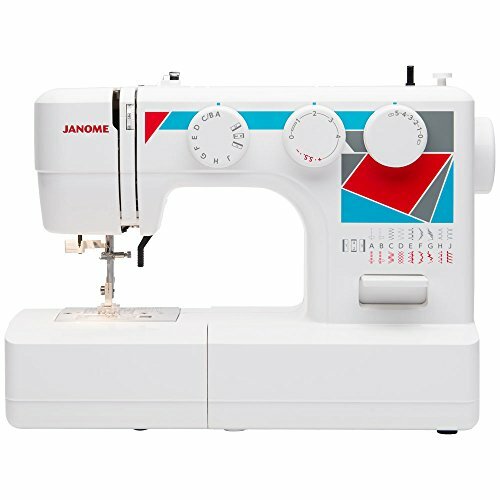 The Janome Memory Craft 6300P is a heavy-duty sewing machine with lots of speed and power. It comes with a speed control slider and has an astounding maximum speed of 1,000 stitches per minute. You also get an LCD screen, 66 built-in stitches, and four one-step buttonholes. Unfortunately, it also weighs 26 pounds. This means it’s not very portable. Customers love this machine for its speed and power. It can easily sew through multiple layers at once. It also has plenty of throat space and is easy to set up and use. One major complaint regarding this machine is the fact that it lacks a free arm. This is very unusual when you consider the price of this product That brings us to the other major complaint. This sewing machine is a very strong, dependable machine, but this is obviously too expensive for most of us. It might be worth it if you’re an experienced sewist who’s looking for something that will last a long time. However, beginners will probably want to start with something cheaper. This machine has 3.7 out of 5 stars on Amazon. The Brother CS6000i is a great, all-around machine with a very affordable price. It weighs only 13 pounds, making it a very portable sewing machine. It also has a maximum speed of 850. Furthermore, you get 60 built-in stitches and seven styles of one-step buttonholes. It even has an LCD and a compartment in the arm for storing accessories. Many customers have raved about this sewing machine because it’s quiet, portable, and easy to use. Most beginning sewists don't have any trouble getting started. However, there have been a few small complaints. Many people have had difficulty adjusting the tension on this machine. The bobbin can also be a bit troublesome at times. The Brother CS6000i will cost between $120 and $250. 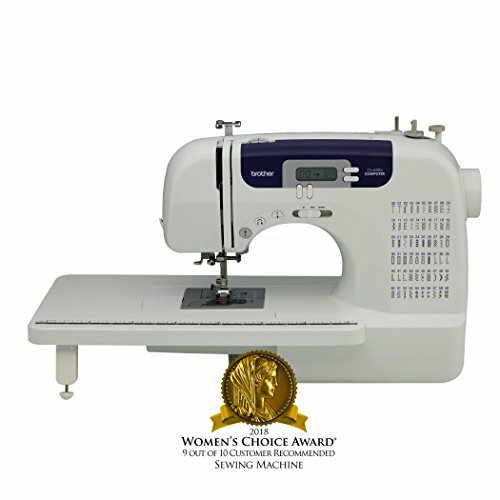 This makes it one of the most affordable sewing machines for quilting on the market. While it does have a few minor issues, its dependability and ease of use make it a great machine for beginners. These things, along with its small price tag, lead many people to call it the best sewing machine for quilting. It currently has 4.5 out of 5 stars on Amazon. 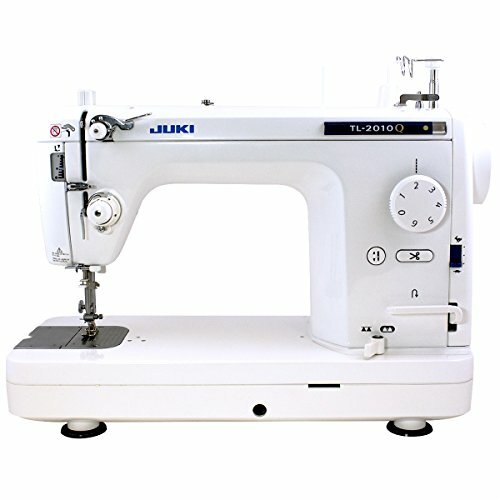 The Juki HZL-F600 is another excellent sewing machine from Juki. This one is part of their Exceed series. It comes with an impressive 225 stitches and 16 buttonhole styles. It’s a little hefty at 21 pounds. It also stitches up to 900 stitches per minute. It has onboard guides that allow you to customize your stitching experience in a variety of ways. You can even save combinations of stitches and lettering so you can recall them later. This is a very popular sewing machine among quilters because of its vast array of features, large throat space, and heavy-duty build. It also runs very quietly. There have been relatively few complaints. However, a few people have noted that it requires a lot of adjustments before it can stitch properly. For this reason, it might not be the best machine for beginners. The price could also be a major deterrent. It might be a worthwhile investment if you’re a serious quilter that’s looking for the best sewing machine for quilting. However, beginners will probably want to start with something a little more affordable. Amazon gives this machine 4.7 out of 5 stars. 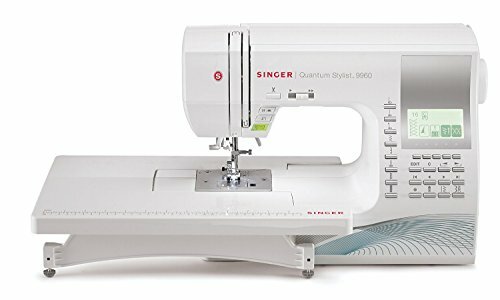 The Singer Confidence 7469Q is a sewing machine designed with quilters in mind. It weighs only 19 pounds and has a maximum speed of 750 stitches per minute. You also get 98 built-in stitches and a needle up/down button so you can stop the needle in the down position. It also has an easy to use a drop and sew bobbin system and seven one-step buttonhole styles. It even comes with four different quilting feet. Many customers love this machine because it has several features that quilters need. The needle up/down option and drop and sew bobbin are especially popular. It’s also very easy to use. Unfortunately, there have been multiple complaints concerning its quality. Several people have issues with parts not working correctly and needles getting stuck. Luckily, you won’t have to spend too much on this sewing machine. Overall, it’s a very good machine for beginning quilters. However, you might want to invest in something a little more expensive if you have the money. Amazon gives this product 4.3 out of 5 stars. 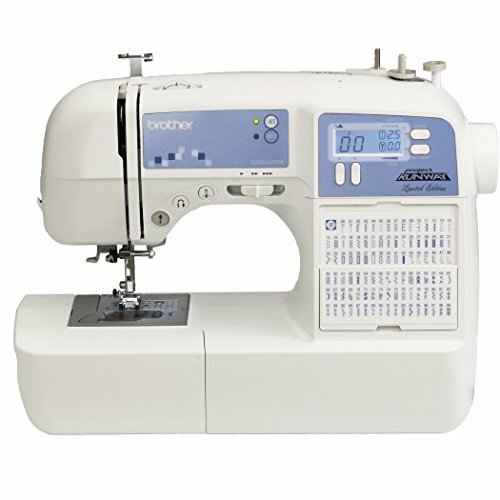 The Brother XR9500PRW Project Runway is another great sewing machine with many features that quilters will appreciate. It comes with 100 built-in stitches and eight styles of one-step buttonholes. There’s an LCD screen that easily allows you to choose your stitches and lettering. You also get a needle up/down button and brightly lit LED lights. This sewing machine weighs only 10 pounds and has a maximum speed of 850 stitches per minute. Customers love this machine because it’s easy to set up and use. There's even a DVD to help you get started. Several of its features are geared toward quilting, which was another major selling point. Unfortunately, there have been a few complaints about its lettering being ineffective or not working properly. There have been a few complaints about the noise as well. It’s a reasonably affordable product, and you get a very good value for the price. This makes it an excellent sewing machine for beginning quilters. It could be the best sewing machine for quilting if you're just getting started. Amazon gives this product 4.5 out of 5 stars. Before we look at the best sewing machine for quilting, you probably have a few questions that need answering. Of course, quilting is a kind of sewing. However, sewing a quilt comes with many of its own challenges. For one, quilts are naturally larger than most other fabrics used for sewing. For this reason, it’s good to find a sewing machine with a large amount of throat space. This will make the quilt much easier to work with while you’re sewing it. Quilting also involves working with multiple layers of fabric. Some machines have the power to handle this while others do not. Similarly, you also want to make sure you have a variety of foot attachments to work with. In particular, you want to make sure you have a walking foot, a darning foot, and a 1/4 foot. Whenever possible, make sure you buy foot attachments made for your machine specifically. Generic foot attachments are not going to work as well. There are a few features that will make your life a whole lot easier. For one, the best sewing machine for quilts is going to have a needle up/down control. This allows you to control whether the needle stops in an up or down position when you’re finished sewing. Having the needle stop in the down position will allow you to take a break without the quilt shifting away from you. Being able to control the maximum speed of your machine is also incredibly helpful. You should be able to control how fast the machine will go when the foot pedal is all the way down. This allows you to take your time when free motion quilting. Otherwise, you’d have to worry about how fast you’re constantly going. These are features that you don’t really need, but you’ll be glad you have them when you do. Many modern sewing machines have LCD screens that offer many functions. Some of them recommend what stitches or foot attachments you should use, while others allow you to save combinations of stitches and lettering for later use. You also want to think about portability. Lighter sewing machines allow you to take them with you wherever you go. This way, you’re not just stuck in one place. Remember, plastic sewing machines are much lighter than metal sewing machines. The price for a good quilting machine can vary considerably. You could end up paying anywhere from $150 to $1,500. The price difference mostly depends on what materials the machine is made of. Machines that are plastic tend to be cheaper and lighter. However, they tend to have issues in the long run. Machines that are metal are heavier and sturdier. Unfortunately, they’re also more expensive. This is what you have to expect from the best sewing machine for quilting. As you can see, each one of these machines has its own strengths and weaknesses. Any of them could claim to be the best sewing machine for quilting. It all depends on what you’re looking for. If you’re on a budget, you might consider the Brother XR9500PRW Project Runway. Or you might go with the Juki HZL-F600 if you have more money to spend. The Juki TL-2000Qi is a very good product that lies somewhere in the middle. When making a decision, you really need to consider your needs. Are you on a budget? Do you need a machine that’s beginner-friendly? Or are you an experienced quilter who’s looking for something that will last a long time? No matter what you decide, you’re sure to end up with the best sewing machine for quilting.